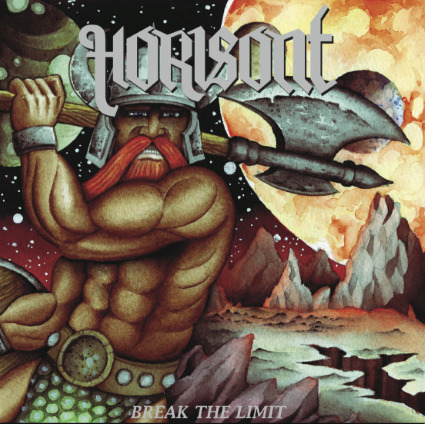 Kingdom of Noise: Horisont - Break the Limit 7"
If you've been waiting for Swedish throwback rockers Horisont to release a new album you'll have to wait a little longer. I know, Fall 2013 was so long ago! But in the meantime the quintet has released a killer 7” called Break the Limit (Rise Above) to whet the appetite. Comprised of two songs both just barely cracking the four minute mark, it's not much but the boys pack in as much as they can. “Break the Limit” utilizes deft fret work and cruisin' riffs to great effect, immediately taking the listener back to the days of yore. The chorus is as hooky as Hell is hot in August particularly thanks to vocalist Axel Söderberg himself. When he hits those hight notes you just have to sing along. Or at least try to. Drummer Pontus Jordan is swift and filly, with jazzy movement. The bridge is slow(er), ominous and heavy on Magnus Delborg's bass. And of course, guitarists Charlie Van Loo and Kristofer Möller simply tear it up with soaring guitarmonies and shredding solos. Flipping over to “Yellow Blues” we're greeted by some fancy keyboard work. No word on who's playing them but they need to keep it up! It lends extra flair to the bellbottoms and makes hair grow. They don't stick around too long as they give way to some rumbling riffage. Jordan propels his thunder feet down the highway like a semi without brakes. The keys come back with a psychedelic edge just before the glory. Van Loo and Möller battle each other as if they went down to Georgia. It's all very bluesy and such but when they lock horns together they just fire off into the stratosphere. Fantastic. I actually missed out on 2013's Time Warriors so this 7” is the first I've heard Horisont since 2012's Second Assault and I just about forgot how tight these guys are. I never realized how much Söderberg reminds me of Early Man's Mike Conte until now. A Horisont tour with Early Man and Dune would be stellar! Anyway, as good as Break the Limit is, it's more of a tease than a stop-gap. These songs have a fire burning under them and one can only hope that extra energy carries over to a new full length as soon as possible. In the meantime, check out the video for “Break the Limit”! Released November 3, 2015 on Rise Above Records.